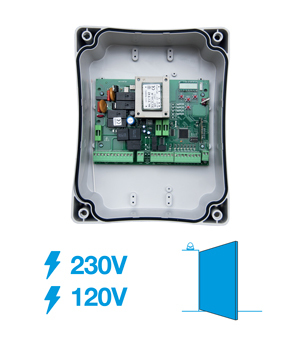 BIOS1 Control unit for sliding gates and barriers, without transformer. 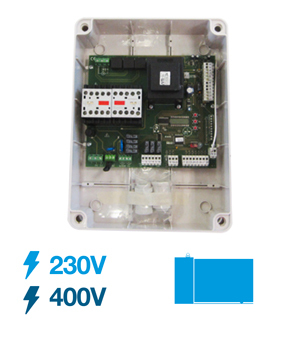 • Control unit with managing of a transmitter through the display. • Extractable memory and terminal boards. • Learning up to 1000 transmitters. • Functions selection through display. • Differentiable slowing downs during opening and closing phase. • Self-diagnosis of safety devices. • Led for inputs status. Inputs: open button, close button, step–by–step button, pedestrian button, stop button, 2 photocells, safety edge, open and close limit switch. Outputs: Integrated flashing circuit 230 Vac, courtesy light and power supply accessories (24 Vdc). 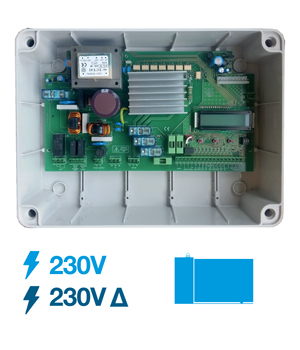 BIOS1 24V Control unit for sliding gates, without transformer. BIOS2 Control unit for gates with 1 or 2 wings. Inputs: open button, close button, step–by–step button, pedestrian button, stop button, 2 photocells and safety edge. 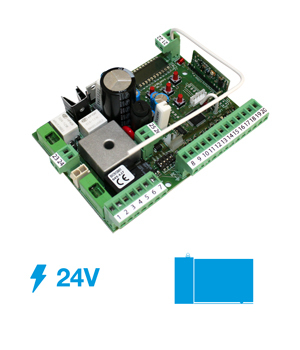 Outputs: Integrated flashing circuit 230 Vac, courtesy light/open gate warning light and power supply accessories (24 Vdc)..
BIOS2 ECO Control unit for gates with 1 or 2 wings. • Optional R2 card for the managing of courtesy light / open gate warning light and electrical lock. Inputs: open button, close button, step–by–step button, pedestrian button, stop button and 2 photocells. 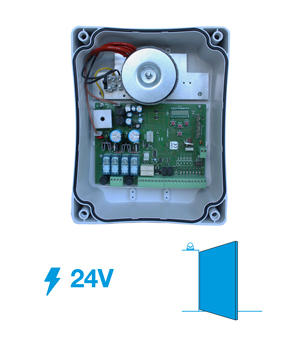 Outputs: Integrated flashing circuit 230 Vac, courtesy light/open gate warning light, elecktrical lock and power supply accessories (24 Vdc). 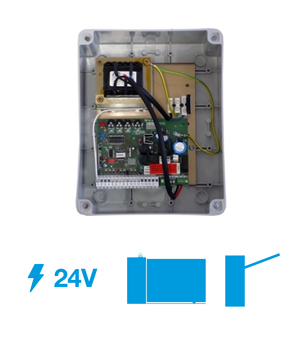 BIOS2 24V Control unit for gates with 1 or 2 wings. The control unit AM900ECO is a control unit developed to control rolling shutters in an easy and intuitive way. 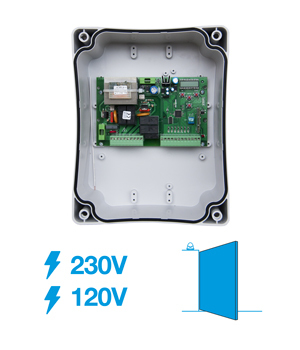 This product controls motors up to 230Vac up to 1000W. It is equipped with a courtesy light output. The product is compliant with transmitters B.ro with 2 or 3 buttons. It is equipped with a photocells output. Control units for 1 gearmotor 24 Vdc. 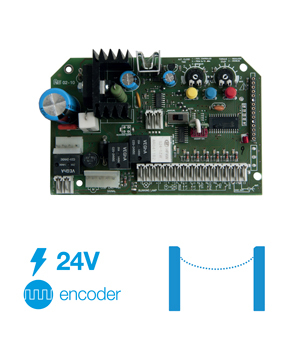 SCOR.AS Control unit for motors without encoder for sliding gates and barrier BEVK. • Built – in decoding for fixed and rolling code. • Adjusting of the motor’s effort at regularly running and during the slowing down. • Adjustable automatic reclosing time. Inputs: step–by–step button, pedestrian button, stop button, open and close limit switch, photocells and safety edge. Output: flashing light output, courtesy light, power supply for accessories and motor 24Vac/dc. 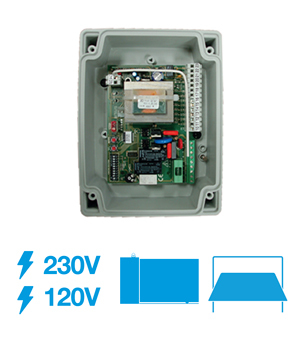 Control unit for TECNO CAT barrier 24 Vdc. ACTION Control unit with encoder for barriers TECNO CAT. Inputs: step–by–step button, pedestrian button, stop button, open and close limit switch and photocells. Output: flashing light output and courtesy light. WARNING: It’s absolutely necessary to use each control unit only with the automation how is indicated on it. Control units for single phase and three-phase motors. 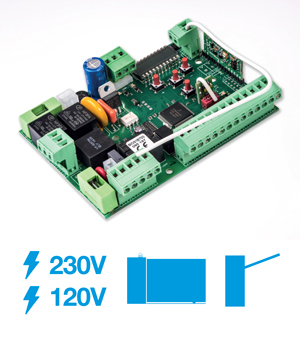 CT INVERTER Control board for the operating and controlling of industrial automations equipped with one THREE PHASES MOTOR 230 Vac 50Hz 1,5KW (delta connected Δ) and SINGLE PHASE 230 Vac 50Hz WITHOUT START capacitor. • Impact sensor function with variable sensitivity (only version with Encoder and during the movement at cruising speed). • Current electronically limited at 10A. • Wide backlit display with 2 lines 16 characters and 3 buttons for the adjustment of all the parameters. Inputs: open button, close button, step–by–step button, pedestrian button, stop button, open and close limit switch, photocell and safety edge. 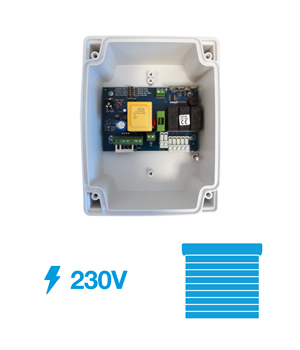 Outputs: integrated traffic light output, integrated flashing circuit 230 Vac, courtesy light, accessories power supply 24 Vav/dc. SINGLE PHASE Box with buttons. THREE PHASE 230 Vac Box with buttons. THREE PHASE 230 Vac Simple box. CT INVERTER SINGLE PHASE SK. Control units for three-phase motors. CT3IND control board for the operating and controlling, through contactors, of industrial automations equipped with one THREE PHASES MOTOR 400 Vac 50Hz 1.5KW Max or SINGLE PHASE 230 Vac 50Hz 800W Max. • Amperometric sensor in each phase for the obstacles detection. • Motor protection function that limits the maximum current (current limited to 10A). • Wide display and 3 keys for the setting of the parameters. Inputs: open button, close button, step–by–step button, pedestrian button, stop button, open and close limit switch, 2 photocells and 2 safety edges (N.C. or 8k2). BAX900 Control unit for roll-up shutters. • Easy setting of working time by trimmer. • Radio receiver module IB1.M. • Power supply for accessories, 24 Vdc. 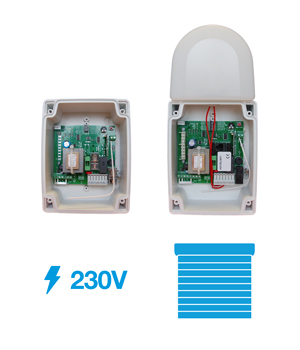 Inputs: open button, close button, stop button and photocell. BAX900L Control unit for roll-up shutters, in box with courtesy light. • Molex connector for safety edge. Inputs: open button, close button, stop button, photocell and molex connector for safety edge. ERMES2 For bascule and sliding gates, It can be directly installed on-board the motor. • Built–in decoding for fixed and rolling code. • Function selection by dip switch. • Time or limit switch controlled slowing downs. • Self–diagnosis of the safety devices. • Integrated flashing light circuit. • Integrated courtesy light circuit. • Power supply for accessories, 24 Vac maximum 3W. Inputs: step–by–step button, stop button, photocell, safety edge, open and close limit switch.